There are a number of things we can learn from this highly targeted, user-friendly and free-to-the-public institution, including the five best practices below. Notes like these appeared throughout the exhibit, displaying the three perspectives of its creators. 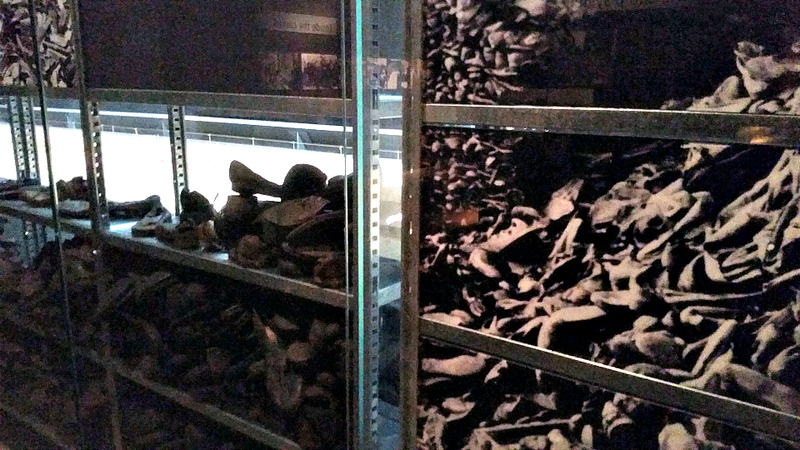 Throughout the primary World War II exhibit, printed notecards appear on various elements explaining the rationale for inclusion. Curators, historians and exhibit designers have unique and varying perspectives, all of which provide context and make for a more robust, authentic viewer experience. The IWM’s “Family at War” exhibit may be the best exhibit I’ve visited. The British World War II homefront comes to life as we follow a single family (with ten children!) through the war. Sons join the fight and daughters the workforce as their parents attempt to hold it all together. Unfortunately, this exhibit is tucked away on the World War II floor and easy to miss, if you’re not aware of its existence. “Family at War” includes a detailed, small-scale model of the family home which helps display additional challenges of the era: the lack of electricity and close quarters of a large family. 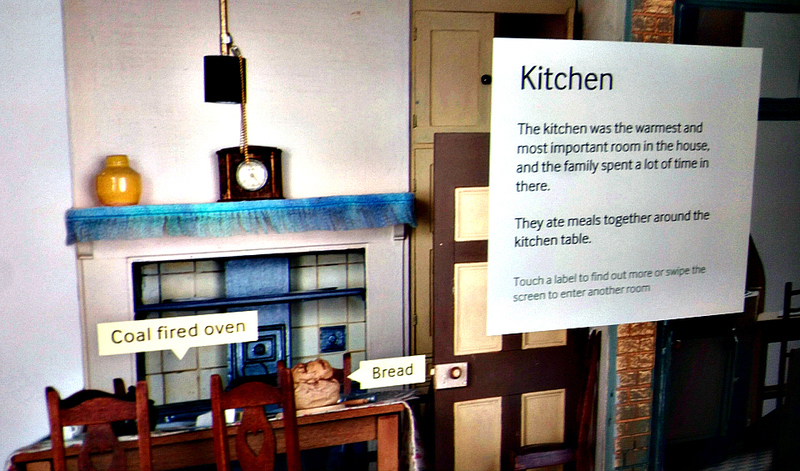 Digital displays allow visitors to probe deeper into the stories of the home and historic artifacts lend credibility and authenticity to the overall narrative. This mix allows the IWM to celebrate the past while embracing the 21st century’s storytelling advantages. One of the most interesting – and relatively simple – engagement opportunities asks visitors a question, and then prompts those visitors to push a button. The button illuminates an internal box that reveals an answer to that question. 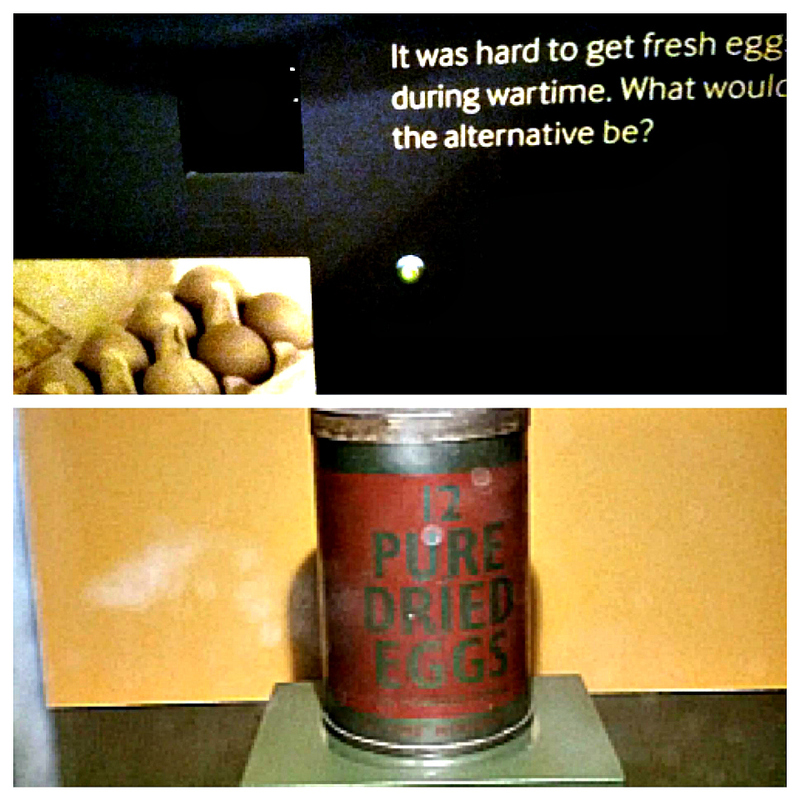 The wall asks a simple question: It was hard to get fresh eggs during wartime. What would the alternative be? After you press the button, the can appears within the black box at top left. 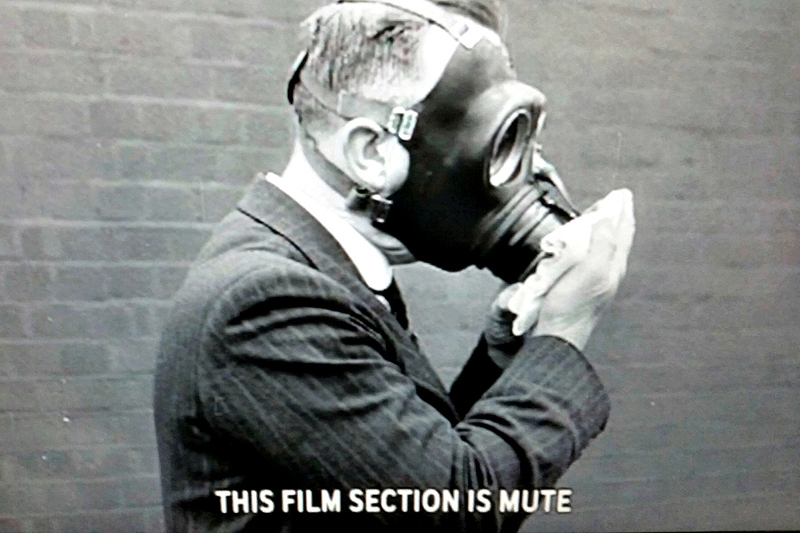 Some sections use overall sound, others have directional, single-listener audio and still others have no sound at all. Without prompts, it is difficult to know what to expect. 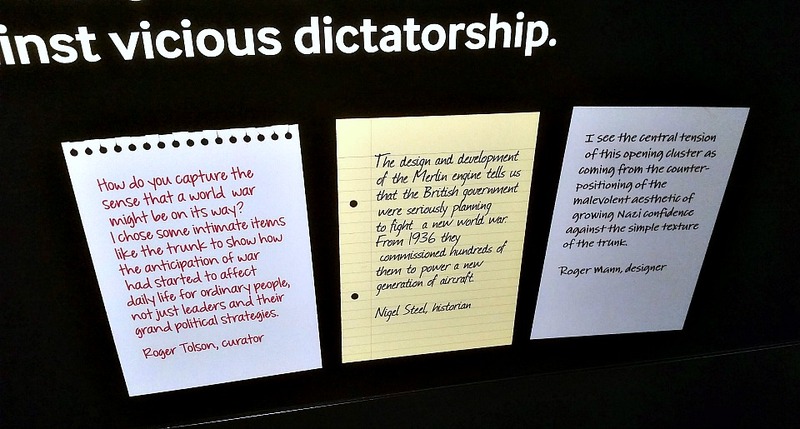 The IWM deals with this in a smart way: they tell us. Setting audience expectations is essential when crafting a good visitor experience. Letting an audience know when, where and how to listen for audio helps them absorb your message. Museums do not always have quantity – they most often have quality. To allow your quality to lead, yet still articulate quantity, consider augmenting artifacts with visuals and digital media. Though the IWM is incredibly impressive, there is room for improvement. You may want to consider the following when redesigning your own exhibit spaces. It can feel awkward to stand in one spot for more than a minute or two, blocking and bottlenecking visitors who follow you. By creating short, digestible chunks of video, you can keep visitors moving through the space while avoiding the feeling they’re missing something. In the case of the World War II floor, it felt like I was entering the war in the middle. Due to the layout of the space, I had to double-back through the exhibit to reach the second half of the war, which weakened the narrative arc. Consider clear signage to direct the visitor in the optimal way. Argh. The bane of technology. The content contained on the touchscreens was so cool yet it was sometimes too difficult to access. After a click or two, my fingers inevitably failed to open new sections. I resorted to going to the next touchscreen to reach the next chapter of information. Make sure to check any technology on a regular basis to avoid visitor frustration. Overall, the Imperial War Museum is a terrific experience and chock full of impressive and engaging military and social history. While your institution may not have the Queen of England’s backing, there are takeaways that apply to any museum. Next time you’re in London, we strongly encourage you to visit! What relatively under-the-radar museums (at least for tourists) have impressed you? Let me know in the comments! Main image of London’s Imperial War Museum by Martin Stitchener via Creative Commons license (no edits or changes were made to the image).